A public hearing was held Tuesday night by the Red Bank Commission regarding rezoning properties that abut Dayton Boulevard from Meadowbrook Drive to Barker Road from C-1 Commercial to C-3 Neighborhood Commercial. The council’s intent in this rezoning is to protect neighborhoods and the property that comes up to the commercial properties that are already there, it was stated. It is hoped that the change will enhance value and soften the commercial impact on those neighborhoods, said Mayor Eddie Pierce. C-1 zoning allows a broad range of uses, but C-3 is more restrictive. Businesses will still have to follow the city’s design standards. The size of the footprint is limited with this zoning designation. Buildings that already have C-1 zoning will be grandfathered in with its current use; however if it is sold, in order to retain C-1 zoning, the use cannot change. The grandfathered status is lost if use of the property is changed and it will then be zoned as C-3. Concern came from one speaker who uses property at 4422 Dayton Blvd. as a warehouse. He said the change may enhance residential property values but it would lower the value of his, if he ever sells it, because there will be fewer buyers for limited commercial uses. The commissioners voted unanimously for the zoning changes that Mayor Pierce said would address the long-range land use plans of Red Bank. A second public hearing and vote took place concerning a small cell telecommunications ordinance. The new ordinance that was approved on first reading will apply some rules and regulations for the small cell equipment. A second reading will be required. With a second and final vote, the city’s revised and updated sign ordinance was passed. 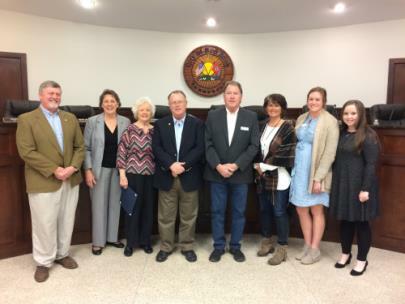 A resolution authorized the Pratt Family Partners to use temporarily, the right-of-way along 1738 Dayton Boulevard for constructing a dumpster enclosure that will be used by multiple area businesses. An ordinance was recently passed that allows use of public right-of-way without the city giving up the property. When it is needed by the city, any use of the property would have to be removed. Representatives from the Red Bank and Soddy Daisy Charitable Foundation presented the city with a check for $23,200 with the condition that the money be used to enhance the lives of the citizens. This year the grant was designated to buy Christmas decorations to replace those that were lost in a fire several years ago. These decorations will be added to the ones that were bought with the foundation’s gift last year. The council recognized Benchmark Therapy and Marlene Eberhart for their contributions and valuable services including exercise programs that have been provided to Seniors on the Go. City Manager Tim Thornbury announced the upcoming Jubilee that will take place on May 4. This will be the Jubilee’s 40th year, he said, and the celebration will have activities for both children and adults. Applications for the parade and for vendors are on the city’s website.